If you are printing GS1 barcode coupons and need to ensure that they are constructed correctly, you need GS1 verification. The barcodes use GS1 DataBar Expanded symbology for retailers to encode offers, but to avoid costly errors, you must meet GS1 standards. Webscan verification technology can determine the coupon code, offer code, purchase required code and expiry date, amongst other variables in the data format check. Each verifier listed above has different features, but they will all ensure adherence to GS1 standards according to ISO specifications. 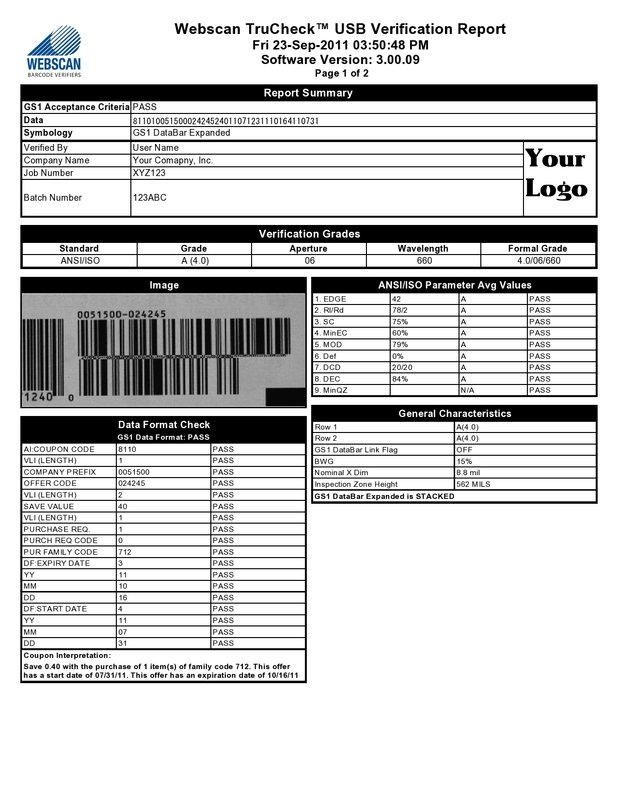 Below is a sample GS1 verification report that can be generated from any of the above products which interprets the meaning of the coupon code as well as verifying that the code was printed correctly.